The Venezuelan National Assembly, headed by opposition leader Juan Guaido, has introduced a state of emergency in the country due to the extremely difficult situation with the electricity supply. This happened at a meeting of parliament on Monday, March 11. The government body that was under the control of opponents of the legitimate president, Nicholas Maduro, did not immediately make such a decision - the discussion lasted several hours. However, it was the speech of the proclaimed interim president that Guaido convinced the assembly of the need to introduce a state of emergency lasting for a month with the possibility of its extension for the same period. He said that such a measure would allow to turn to other countries for help. According to the politician, this possibility was discussed with Germany, Japan, Colombia and Brazil. The impostor "forgot" about another country, the abbreviated name of which is an abbreviation of three letters. However, it is clear that the puppet of Washington acts mainly in accordance with the instructions received. Before deciding to invade the country, the Americans use all possible ways to destabilize the situation. We must pay tribute to the States - this blow to the positions of Maduro was a success for them. Guaido also announced large-scale protests related to the blackout in Venezuela. He called on people in Caracas and other cities to take to the streets on March 12 to show Maduro and his government that this power is responsible for the catastrophic situation in the country. The legitimate head of state, in turn, holds up his defense, declaring that the “battle for the liberation of the national electric system” continues. In the conditions of sabotage and cyber attacks, it is extremely difficult to do this, so Maduro does not promise specific deadlines for solving the problem. If for the first month and a half after the self-proclamation of Guaido as interim president, the life of Venezuela proceeded in a more or less usual way, then without electricity in 20 of the 23 states, including Caracas, it was practically paralyzed. The fifth day does not operate the subway, the Internet, there are regular interruptions in water, serious problems have arisen in the work of most infrastructure facilities, from airports to hospitals. Marauders began to rob shops. It is almost impossible to buy something in cash from them, and paper money cannot be removed from the cards - ATMs are turned off. Those who have generators are saved with their help. This provoked large queues at gas stations from those wishing to buy fuel for these installations. Some people manage to charge their mobile phones from special devices installed on the streets and powered by solar panels. And here a large number of people who want to get access to vital energy exceeds the possibilities. Despite the fact that by March 11 the power supply in the capital was restored by 40%, this day was declared a holiday, including in educational institutions. 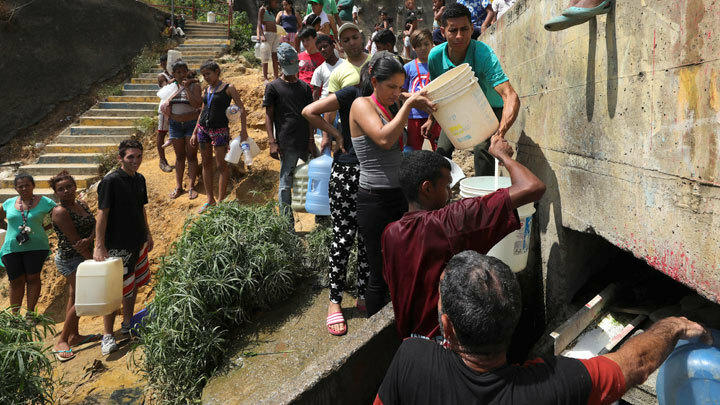 Venezuelan President Nicolas Maduro has ordered the provision of citizens in need food sets and drinking water, which will be brought to the houses in tanks. Special attention is paid to hospitals - they will not work to close them, as a business center with offices. It is necessary to understand that the state of emergency introduced by Guaido is only a formality designed to increase pressure on Venezuela from the outside. Typically, such a measure is needed to mobilize forces within a country or a region — first and foremost, law enforcement agencies, which in an emergency need to maintain order and help other services. However, for the army and the police, who remain loyal to Maduro, all these statements are not a decree. And the fact that sabotage at energy facilities made the situation in the country extraordinary is understandable without an impostor. Another thing is that as soon as it is possible to stabilize the supply of electricity and ensure the protection of the system, life in Venezuela will again take its course. Ordinary citizens see that the authorities are really taking some measures in the circumstances, while the opposition leader only does what he says, calling for Maduro to be removed. In parallel with the organization and implementation of sabotage inside Venezuela, the United States continues to exert pressure from outside. March 11 was fulfilled a promise to impose restrictions against those who continue to do business with official Caracas. US special envoy for Venezuela Elliott Abrams promises other measures that can be applied depending on "the behavior of the Maduro regime." Today, the 17th Summit of the Non-Aligned Movement begins on Margarita island.